Many homeowners favor tile due to its enduring elegance. However, some people balk at its maintenance needs and upfront cost. However, at Village Carpets Flooring America, we offer a great alternative to traditional tile: luxury vinyl. Our store offers one of the largest collections of luxury vinyl tiles in Santee, CA, with numerous styles to choose from. 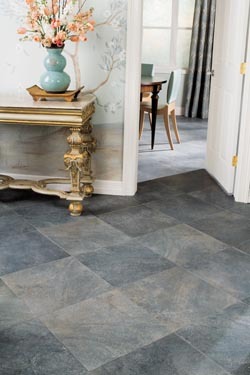 This flooring type combines the elegance of tile with the versatility and resilience of vinyl. Vinyl is now more durable and long-lasting than ever before thanks to modern manufacturing innovations. Best of all, minimal upkeep is necessary to maintain its appearance. Routine sweeping and vacuuming will keep your vinyl surface clean and occasional damp mopping is typically enough to ensure it looks new years after installation. For more information about caring for your luxury vinyl tile floor, talk to our staff today. Your floor is one of the biggest aspects of your interior design. That’s why it’s crucial to find a surface the complements the rest of your décor, while also meeting your performance expectations. We make it easy to discover the right flooring at our showroom. Our diverse array of vinyl tile offers something for ever shopper. Vinyl is among the most versatile flooring material, with nearly any design possible. Whether you prefer timeless, conservative styles or bold, contemporary looks, we have a LVT floor for you. When you are not sure which style best suits your interior design-- our team is happy to recommend surfaces based on your specific needs. Let us know what types of designs you prefer and what your overall goal is for the room. In addition, it’s helpful to know about your lifestyle, needs, and price range. Based on this information, our team leads you towards the vinyl tile surfaces most likely to heighten the beauty and function of your room. When you are ready for luxury vinyl tile floor installation; leave it to us. Our professional installers will ensure everything is placed correctly and according to the warranty. Since vinyl can be installed on virtually any surface, minimal preparation is necessary. In no time at all, your new floor will be ready to use and show off to all your visitors. Reach out to our store to learn more about our installers and our detail-oriented process. Contact us for further information on our wide selection of luxury vinyl tile products. We proudly serve shoppers from throughout Santee, El Cajon, La Mesa, Alpine, and San Diego, California, as well as the surrounding areas.